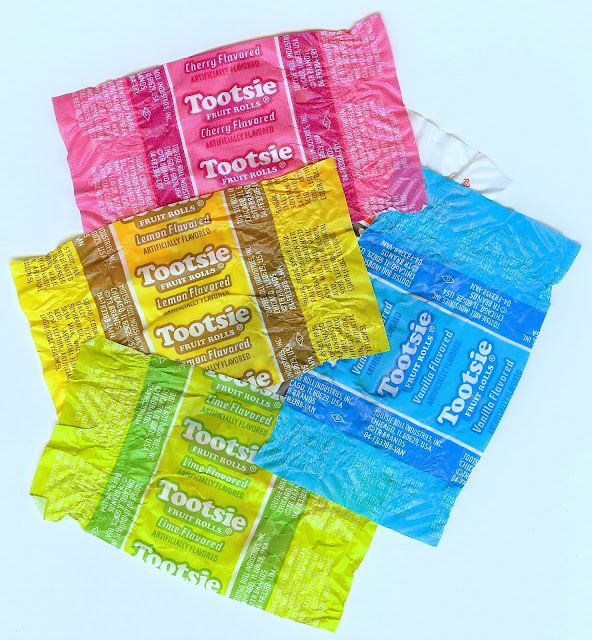 Everyone have a safe, fun, stomach filling, sweet-tooth satisfying Halloween!! Saturday was the 10th annual Kinetic Sculpture Races at the Ventura harbor. I had never gone so I headed down with my camera to check it out. 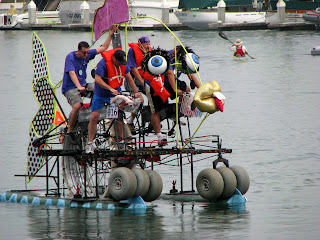 The kinetic sculptures are whimsically decorated man-powered vehicles. They are raced first in the water, then over the sand, then around an oval course in the Ventura Harbor parking lot, and finally across a mud pit. The weather was overcast and drizzly which kept everything cool and, early on, the crowds small. I arrived around 10:00 am, parked near the stores and restaurants at the Ventura Harbor Village, and walked down to the headquarters of Channel Island National Park. The race was going to start across the waterway from the headquarters. Since they were not in the water yet, I wandered around the visitors center and looked at the exhibits and the park store. I noticed a guy with a video camera set up videoing the crowds near the starting point. He had his camera and head covered with his jacket. I assumed this was to keep the drizzle off his camera. Then I heard him talking. I figured that he was just narrating his footage but things got a little strange when he started talking in a different voice - he was pretending to interview a spectator watching the race preparation. This was especially weird after the FEMA press conference bru-ha-ha. I should have asked him what he was doing but I decided to just moved along. When the race finally started I realized that this was going to be a very slow race. If you've ever seen a paddle boat in the water, they don't move very fast. This is especially true when they are home made paddle boats. I could easily out walk most of the vehicles. I decided to walk around and look for some food. I figured I'd have a better chance to see the racers up close when they got on the sand. I stopped at a cafe and ordered a tasty double cheeseburger and had lunch. After lunch I made my way to the beach in time to see the first two racers on the sand. They weren't moving much faster then they were on water. Many of the vehicles had wide tires which worked good on the sand but it still looked hard to pedal most of the vehicles. The contestants were allowed to make minor modifications when then transitioned from one medium to another. Some added wider treads to their tires when they hit the beach. I walked down to where the racers were coming on shore and took some pictures. The race was very informal and there was little security so you could walk right up to the vehicles and talk with the owners if you wanted to. All the contestants were having fun with their designs. I think the Homeless Piranha was the most interesting. It was also a repeat from last year when it was called the Holly Mackerel. I headed back down the beach looking for the finish line for the sand segment. Part of the way down the drizzle became a light shower and I decided to go back to the store/restaurant area to get out of the rain. I looked through some stores. I found a hat store (The Harbor Hatter) and found a wide brimmed, packable hat that looked like it would be good on hikes. I made a mental note to add it to my Christmas list. I had been thinking about ice cream (it's rarely far from my thoughts) so I bought an ice cream cone at Coastal Cone Ice Cream & Yogurt and sat outside, ate the ice cream, read a local newspaper, and listened to some kids doing a play on a small gazebo/stage to a small audience. The showers let up and I went to the mud racing area. The vehicles were being parked nearby in preparation for the laps in the parking lot. This gave me another opportunity to take pictures of the racers. There were about a dozen racers. They varied in complexity. Some of the engineering was impressive. One of them, a two wheeler call Bounce For Glory, was powered by the rider bouncing up and down. It performed amazingly well. The number of wheels varied from two to six with three being a common number. They started the race around the parking lot. The lack of maneuverability of some of the racers resulted in crashes, collisions, and close calls that energized the crowd. Someone near me described it as a Ben Hur chariot race which was a pretty good description. The officials, some dressed in flashy costumes, were pretty loose with the rules as several racers cut corners to bypass traffic jams. One contestant even lost his front wheel and still was allowed to continue racing. The whole race had an air of informality which just made it more relaxed and fun. The last race was through a mud pit. The fire department came in and helped wet down the track. This is when the crowds got thick. A lot of people showed up for just the last two races. As I waited for the the mud to fly I watched all the dogs in the park - there were quite a few, big ones and small one - and I watched the little kids playing with the automatic soap bubble blowers that were filling the race field with bubbles. Older kids were paying $3.00 to play with a slot car track. I chatted with a guy who was there with his dog. He liked my camera. We talked about making movies with our cameras and I turned him onto the Red Bull Air Races. He said he would have to look into it as he had attended several air races in the past. The mud races started and all the racers made it through but quite a few had to get in the mud and push. Everyone really had fun watching them get bogged down in the mud. This was the last portion of the race and frankly, I don't even know who won. I don't think that was the purpose of the race. The purpose was to have fun and everyone there was had fun. This was a fun day. There were several slow parts during the day and I would recommend that if you want to go see this race, show up around 2:00 pm for the parking lot and mud races. They are fast paced and fun to watch. The rest is just too slow. Of course, you can do what I did and do a little window shopping, eat some good food, and enjoy the day out of the house. I took over 150 pictures and the best are here. 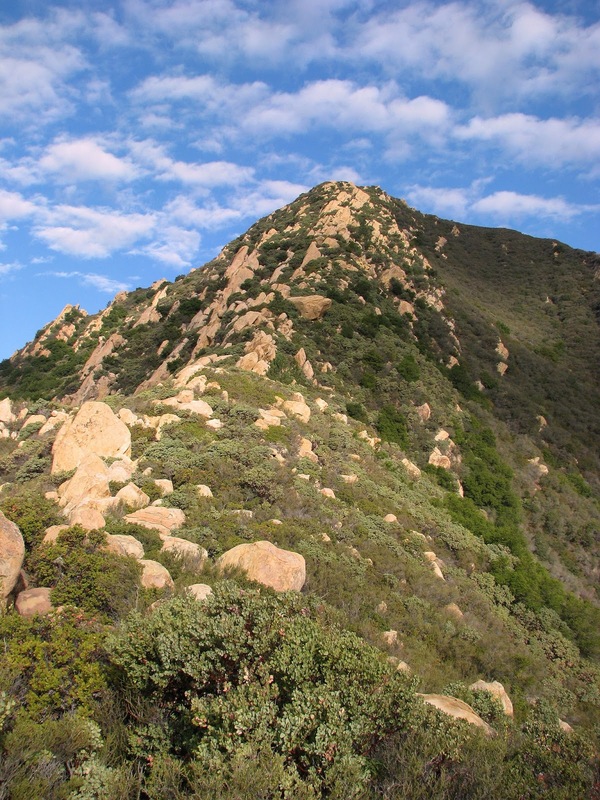 Well, I was planning to hike the Cold Spring Trail up to Montecito Peak in ... well, Montecito. I had been planning the hike all week and planned to extend the hike from 7.5 miles up to 11 or 12 miles by doing both the east and west forks of the Cold Spring trail. I left home early and got to the trailhead at 6:50 am. I got out of the car, walked up to the trail, and read this disappointing notice. The trail was closed due to the fires even though the closest active fire was over 50 miles away. I thought about ignoring the notice and hiking anyway but I'm a law abiding citizen and that idea didn't gain any traction. I drove home all dejected. I got home and plopped down on the couch and fired up the PVR. I had a couple episodes of Journeyman, a couple Bionic Women, and a Torchwood. After watching a couple minutes of the first Journeyman episodes, I stopped it, deleted it and the other episode, and stopped recording it. After three episodes I had finally lost interest in it. It had potential but it just didn't grab me. I cued up the Bionic Woman and watched both episodes. I like how there are storylines that continue from episode to episode. It feels very similar to the new Battlestar Galactica. I think I will give this show a chance. The last was Torchwood. I like Doctor Who and Turchwood has that cheesy British Sci-Fi feel. That's probably because it is a cheesy British sci-fi show. I'm hooked. I finished watching my shows by noon so I decided to make the best of the afternoon and went to Hueneme - Ormond Beach, did a walk on the beach, and searched for geocaches. I had walked this beach before. I didn't bring my camera figuring that the hazy marine layer wouldn't make for good pictures. I like this beach. Today, being a workday and being hazy and a little chilly, the beach was nearly deserted. I saw only three fishermen on the 3 mile long beach. The only other company I had were birds including a small flock of pelicans that flew overhead in a graceful 'V' formation. The beach is bracketed by the Pacific Ocean on one side and a sandy swampy strip on the other. The marshy pools are home to various water fowl. I heard a splash in a pool. I thought it might have been a bird diving to get something in the water but it never came up. I guess it was either a fish or the creature from the black lagoon. Not sure which. The view along the beach was only broken by a power plant. I would complain about the rather ugly power plant but without those power plants all the gadgets that we geeks love and cherish would not exist. What would I do without my laptop, my GPS, my MP3 player - the horror! Speaking of gadgets, I had loaded 13 geocaches in my GPS. I managed to find 10, did not find 2, and didn't even look for the last one. The caches were hidden quite a ways inland amongst the dunes and along a canal that brought water to the power plant and helped irrigate the nearby fields. I had never walked back here - it was surprisingly nice. At one cache I did a travel bug swap - swapping If I Had a Hammer for the Bear called Orse. I also used this walk as an opportunity to break-in my new boots. I doubled my socks and my ankles felt pretty good. It was still a little sore but that was because it wasn't totally healed. The added padding of the extra sock helped a lot. I think the boots will work out great. It was a nice day. A nice 6.72 mile walk on the beach. A nice afternoon of geocaching. It almost made up for not being able to hike. 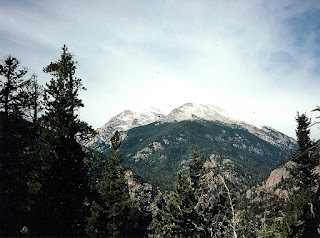 I entered Rocky Mountain National Park from the east. I drove up the road until I reached the part of the road closed due to snow. I parked the car and walked past the gate for a while to see the snow but I never saw much up close - I suspect most of the snow was several miles up the road. The snow did make the mountains shine. I drove back down and did a hike in the Cub Lake and "The Pool". It was a 6.3 mile hike. It was nice enough. When I got back to the car there were some elk grazing nearby. I spent that evening walking around downtown Estes Park. They have a nice downtown though it is a little touristy. I ended up buying a t-shirt, hat, and a small dreamcatcher which hung from my rear-view mirror for years. 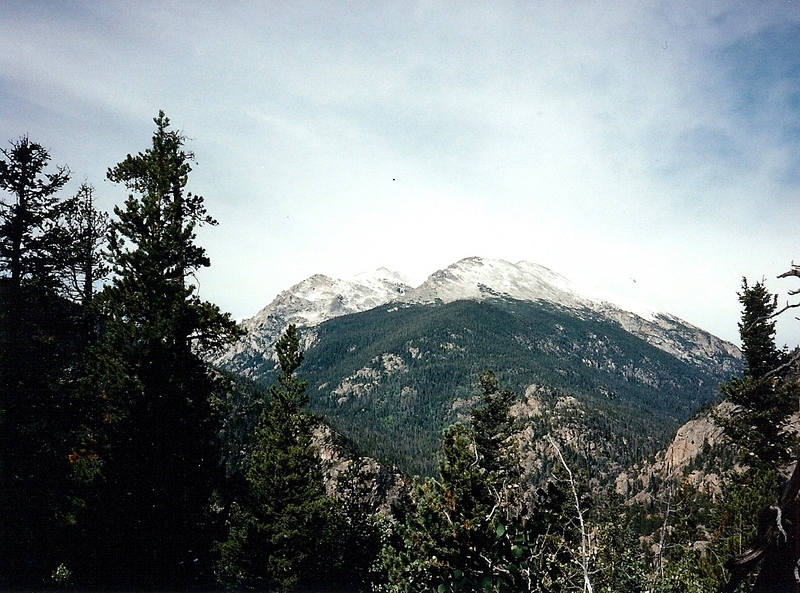 My description of Rocky Mountain National Park and Estes Park are a little lackluster, I know, but I was really getting tired from being on the road for so long - 23 days at this point - and my recollection is a little muted by my mood at the time. I will probably go back there someday to do some better hikes and enjoy what my tired self refused to enjoy the first time. I'd had enough of Estes Park so the next day, after cleaning the fresh snow of my car, I hit the road and drove across the state of Colorado. The weather was dreary and drizzly most of the day. My original route south was closed due tot he snow so I drove down to Pueblo and took highway 50 west to Montrose. I turned south at this point taking 550 south. This is when the rain started. The 550 crosses several mountain passes on its way south. As the road went up in elevation the rain became sleet which rapidly became snow. The wind was blowing and before I knew it I was driving in a full blown blizzard. It was crazy scary as I couldn't see more then ten feet in any direction and I was sure there was a sharp drop off along one side of the road. I crested the first pass and the weather crested at this point as well. As I head back down the snow became rain once again ... until I hit the next pass where it was snowing again. This pass was lower then the first so it wasn't as bad. The third pass was low enough that the rain never became snow. This was the most harrowing part of my entire trip. The rain eventually stopped and I made it to Durango just before sundown. I went downtown to look for some food. Most of the stores were closed. It seemed like a nice place. I thought about staying a day to take the train up to Silverton and back but, I was reading Larry Niven and Jerry Pournelle's Lucifer's Hammer , a book about a collision of an asteroid with the Earth, and this piqued my interest in visiting Meteor Crater. The next morning, after a hearty Denny's breakfast, I drove to Four Corners and did the cheesy tourist thing and walked around all four states before taking route 666 to Gallop. Route 666 has been renumbered since 1995 to 491 to allay the complaints about the religious significance of the number and because it was getting too expensive to replace all the stolen signs - Heh. I ended up in Flagstaff where I did my laundry in preparation for my next destination: the Grand Canyon. Pictures are here. My latest hike is a mix of the old, the new, the good, and the bad. Let's start with the old and the new. I have hiked to the punch bowls twice before. The first time was in 2003 and the second time was in 2004. Both of these times were pretty much the same. Except for the weather, the hikes were very similar. That was the old. The new is quite a bit different. In early 2005 heavy rains closed highway 150. 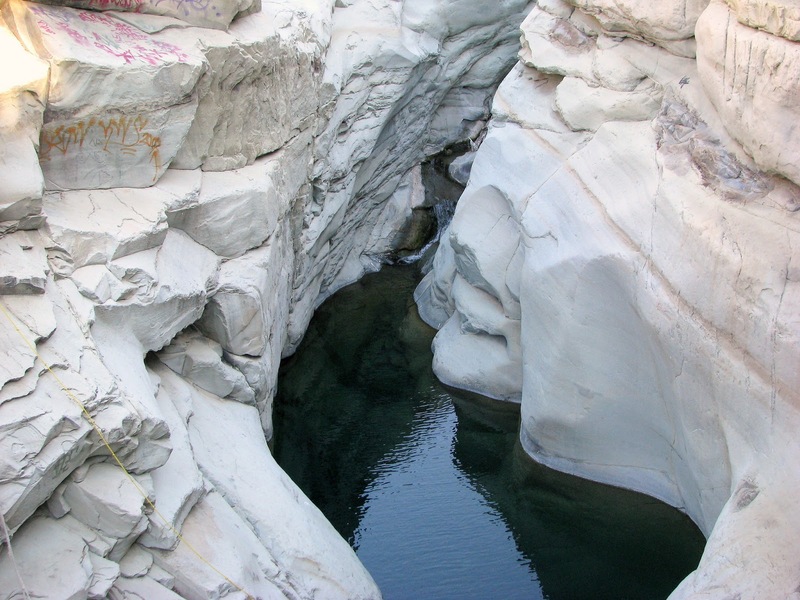 It was closed in several places including where Santa Paula Creek goes under the highway. 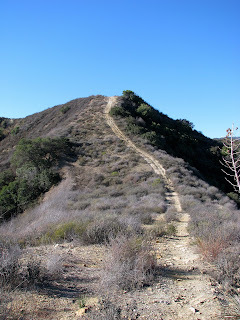 The hike up to the punch bowls and the slides follows the Santa Paula Creek. The rain changed the landscape, and this hike, dramatically. If you blindfolded me and plopped me down on this trail and asked me to identify the trail, I would not have been able to recognize it. The creek, once a relatively narrow flowing creek was now a wide expanse of sand, gravel, and rock. The result is, as usual, I lost the trail. But let me start over from the beginning. The hike starts on the 150 outside the entrance to the Thomas Aquinas College. Hikers are directed around the campus on a paved road. Once you have circled around the campus, you arrive at the entrance to the Ferndale Ranch. The ranch holders are nice enough to allow the passage of hikers through their land. The road passes farm buildings, pastures, and oil wells. At the last set of oil wells at the 1.24 mile point the real trail starts. This is also where I missed the trail. On the old trail the path went on the east side of the creek for awhile before crossing over the other side. I didn't realize that the river crossing was moved much sooner. So I head out on the wrong trail. I saw almost immediately why they had moved the trail. Landslides had blocked several parts of the trail, debris (trees trunks and branches - result of the flash floods) blocked other parts, and river erosion destroyed the trail further on. I was forced to cross the creak a couple times until I came upon a trail marker that got me back on track. Not all the markers were intact. The trail was no longer being maintained and it looked like it. As I walked along the trail I was amazed that I couldn't recognize anything. I found a geocache along this part of the trail. My GPS was off by quite a bit but I found "Pass the Stuffing!!!" with little difficulty. On the old hike the trail met up with a fire road that led you to a river crossing before switchbacking up the hill to Big Cone camp. On the new hike the road was a washed out stream bed with ruts up to four feet deep. The river crossing was so undefined that I missed it all together and didn't realize it for about a quarter mile. I grew tired of rock hopping up the creek, checked my GPS and realized that I had passed the crossing and went back. I found the switchback road which was now only a narrow washed out path. I made my way up and ran smack dab into a huge wash a good 50 to 70 feet wide and 10 to 15 feet deep that obliterated the path. Some nice hiker had tied some ropes to make it easier to first climb into the wash and then climb out. I made it to Big Cone camp. There was a tent up at the camp but nobody around. I assumed that they were at the punch bowl. I am going to interrupt this description to talk about the bad part of this hike. It started a little while back on the trail and got worse when I arrived to the camp. You see, I had made a major faux pax on this hike. I was wearing a new pair of boots. Brand new, never worn. I have never owned real hiking/backpacking boots before. Have you figured it out yet? The fact is, breaking in a new pair of boots on a seven to eight mile hike is not the most intelligent thing to do. I was pleasantly surprised that the boots did not hurt my toes or heals - they were fine - it was the ankles that got me. More specifically the outside of the right ankle felt like I was trying to saw my foot off. Keep this in mind as I tell you about the rest of the hike. After walking through the camp I switchbacked back down to Santa Paula creek. At the creek I sat down, took off my boot and wrapped a handkerchief around the ankle and doubled the sock over to provide some extra cushion. It helped ... a tiny bit. At the creek you had the choice left - the punch bowl - or right - the slides. I turned right and took the path that led up to the slides. The path takes you to a point where you can look down on the punch bowl. There was a guy either teaching, lecturing, or preaching to three other people next to the pool's edge. Not far away was a cross erected to remember a girl who fell from the cliff to her death almost ten years ago - sad. Up here the rock formations, eroded by the water, were really cool. Everything was smooth ands curvy. I found another cache, "Working off the stuffing!!!" where I dropped off the Darth Vader TB that I picked up last week and picked up the If I Had a Hammer... TB. I headed up the creek some more. There was another cache nearby but I ran into some campers so decided to try to look for it on the way back. The hikers, a dad and two boys, had a poor limping dog with them. The dad said that the dog didn't know how to pace herself and he thought he may have to carry it back. They had been hiking for a couple days. The poor thing limped over to me and sniffed my hand. Her legs were wobbly and she looked exhausted. Poor thing. I went further up ahead to a second pool hidden in a narrow, cave-like canyon. You could hear people inside enjoying themselves. I climbed up to the top and looked down into the canyon. Pretty cool. I found another cache, "Punch Drunk", here. I sat down and ate some lunch at this point. I looked at my GPS and realized that I probably hadn't reached the turn around point yet but my ankle was killing me and I thought it was time to head back the three miles or so to the car. I explored the second pool before heading back down. I stopped on the way to look for the last cache but, after thirty minutes of looking and not finding it, I gave up frustrated and moved on. I thought about stopping at the punch bowl to soak my ankle but it was getting late and I needed to get back to the car. There was good on this hike. The scenery was beautiful. I saw deer, birds, and toads. The rock formations around the pools were cool - awesome even. The hike back went as well as could be expected. There were a lot of people swimming and sliding down the natural slides. I passed several people on the way down. There was a scout troop at Big Cone camp. I was able to actually follow the correct trail on the way back. I reached the car and took off the boots. Sometime on the way back the outside of the left ankle started hurting as well - not as bad as the right. I looked at my right ankle. You could see a spot where the boot must have been rubbing - about an inch long and a quarter inch wide - right on the bone. Around this area was a softball sized bruise. Not very attractive - sorry no pictures. I will have to pad the area the next time I hike. I was wearing thick socks this hike so I will probably double up next time. I never expected to have problems around the ankles. The fact is I really like the boots. This hike had a lot of rock hopping and I know these boots rescued me from several twisted ankles. My feet were tired when I got back from the hike but that's not unexpected with all the rock hopping that I did on this hike. Plus I think my feet and legs hadn't recovered completely from last weeks Cathedral Peak hike. I am not going to give up on the boots yet. The hike was 7.79 miles long with about 1,325 feet of vertical. Pictures are here. 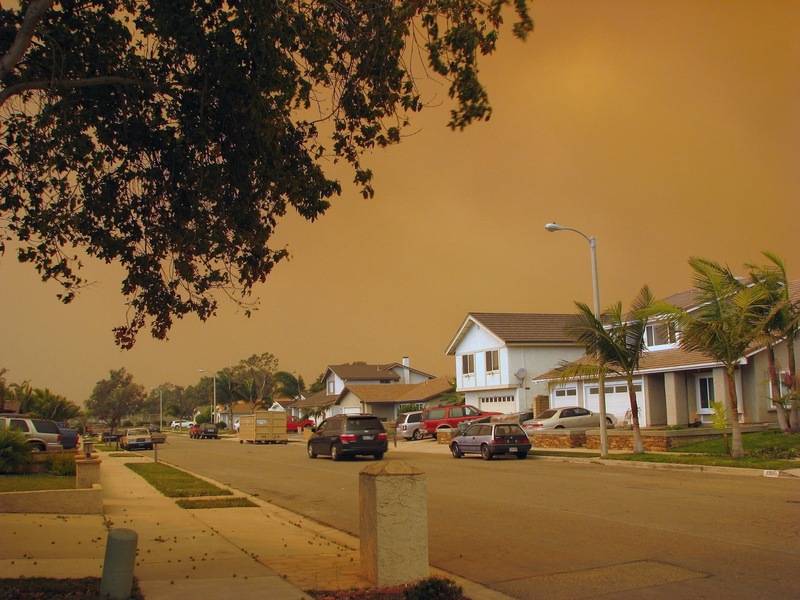 Some of you may have heard of all the fires raging in southern California. 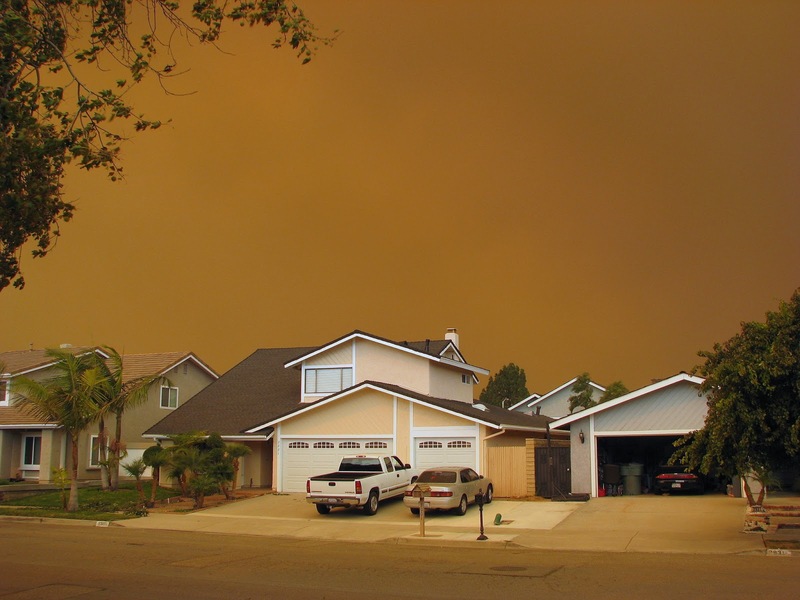 We live in Oxnard, CA and, while we are not threatened by the fires, we are experiencing the smoke. Here are a couple pictures that I took from our front door. The ash is flying and the smell of smoke is everywhere. The wife's and my eyes water everytime we leave the house. It is very Eerie. The night I arrived in Jackson, I walked the central square. The square, bordered with high-end stores with western motifs, is decorated with arches made of elk antlers. It was pretty neat. The next morning I got up early and found a hole in the wall restaurant for breakfast. The line to get in was long but, since I was alone, I was able to get in before some larger parties. I had a humongous plate of Chicken Fried Steak and Eggs – Yum Yum. Breakfast was followed by a trip to the Jackson Hole Mountain Resort and a tram ride up to the top of Rendezvous Mountain. The tram closed in 2006 and a larger tram may be built to replace it. It was cold up at the top. There was spotty patches of snow on the ground and it started to snow while I was up there. A lot of people were underdressed. I had a jacket on and I was pretty comfortable. I hiked up to an overlook and enjoyed the views while I was waiting for the next tram. After returning down to warmth, I drove into the Grand Teton National Park and headed to Jenny Lake. There was a loop trail around the lake which I decided to take. I also took a spur trail that climbed up to Inspiration Point (Inspiration Point ... most overused place names ... Yada Yada). The trail with the spur was about 7 - 8 miles long. The hike was nice. It wasn’t too crowded and most of the trail is relatively flat. You did have to watch out for horse exhaust on the trail but only for the first half or so. Along the trail I ran across a deer or two. When I got to Inspiration point the sun was starting to get low and a chilly wind was blowing. 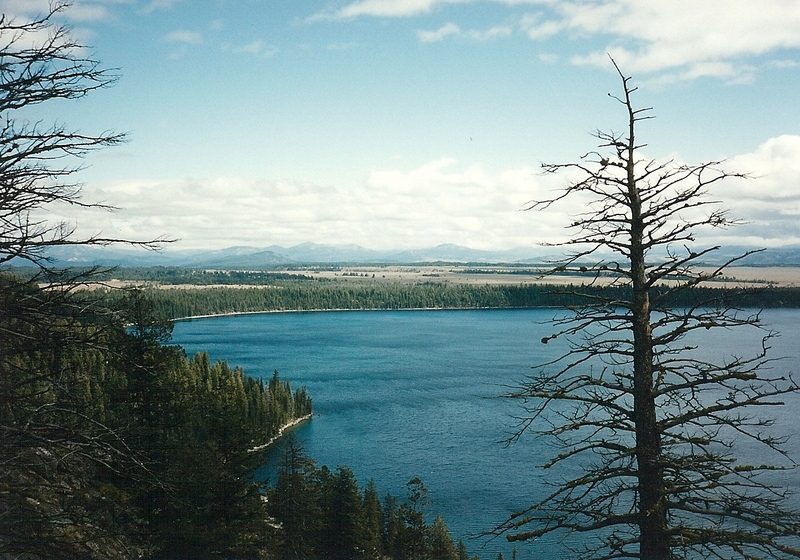 While I had a jacket at Rendezvous Mountain, I did not have my jacket on this hike. The wind was bracing and invigorating. I headed back down to the lake loop trail and headed back to the parking lot. As I approached it was getting dark and I missed the side trail to the parking lot. I realized my mistake a little further on when I recognized a fallen tree that I had passed before. I turned around and managed to get to the car. I drove back to Jackson and went to bed early. The next day was going to be a driving day on the way to Rocky Mountain NP. When I left the hotel the next morning, my car was covered in frost. I drove back into the park and turned east on US-26 which goes over the continental divide. As I got closer to the pass the road became more and more snow and ice covered. I slowed down as I passed cars sitting in the ditch. I managed to make it over the pass without incident. I continued southeast through Wyoming. It was kind of weird to see the buttes covered in snow. I ended the day in Laramie. The next day I left Laramie planning to enter Rocky Mountain NP from the west and take the highest continuous road in the United States (peaking at 12,183) ending up at Estes Park on the east side. I reached the west entrance to the park and discover the road through the park was closed due to snow the previous night. I asked the ranger if the road would open soon and was told that it should be open in a few hours. I looked at short hikes in the region but didn't find anything that really grabbed me so I decided to drive around the park to the east entrance. This part of the drive sucked. Lots of traffic and stop and go until I got through Denver. I reached Estes park and found the park entrance. Turns out the road through the park was still closed. It never did open up while I was there. Pictures are here. Next stop: Rocky Mountain National Park. As I mentioned the other day, after wandering the desert looking for Mary, we ended up visiting some ghost towns. I guess I have a different idea of what a ghost town is supposed to be. I imagine an old, unoccupied town slowly decaying with the passage of time. The key word here is unoccupied. All four of the ghost towns we visited on Saturday were definitely lived in. The first one was Red Mountain. The Ghost Town website has the population as roughly 130. My guess is that the number is much lower. They are not even listed in the census bureau's records. The church is now an elderly center but when we passed through there were two code enforcement vehicles and a moving van in front and it didn't look occupied. The wife commented that the place was depressing and I can't say I disagree. Every rundown house was surrounded by old rusty junk. The second town was Johannesburg. This was the larger of the three towns on or near SR395. The population according to the census bureau is around 176. It was a little more organized and had a gas station but it too looked very rundown and junky looking. The third town was Randsburg. This town was trying it's best to capitalize on it's ghost town label. You could see that there was some effort in draw the tourists to the area. Most of the people we saw were off-roaders, ATVers, and Dirt Bikers. The White House Saloon & Floozy House was fairly busy. The main street was relatively clean and well kept. The population of the town is around 77. We actually stopped and walked around a little here. The main business seemed to be antiques (i.e. junk) stores. We almost bought an old Blue Nun Wine sign (The wife collects nun stuff) but she decided she didn't have a place to put it. I took some pictures of buildings and some of the mining equipment on display outside of the museum (unfortunately closed when we were there). The last town we visited was Willow Springs, west of Rosamond. Many of the original stone building are still standing and appear to be still occupied. It felt like we were driving through someone's farmyard. I was too tired to get out and take pictures and there really wasn't much to take pictures of anyway. It would have felt strange taking pictures of occupied houses. So there you have it. Along with Calico which we visited on the way back from Vegas, these are all the ghost towns that I have ever visited and, truth be told, none have lived up to my expectations. I want old buildings to explore and forgotten detritus of past lives to sift through. I guess my image of a ghost Town is too romanticized. There was one more place I had looked into going to, Garlock, that is the location of William Henry "Burro" Schmidt's tunnel. Burro Schmidt, trying to make a shortcut, dug a tunnel single handedly through Copper Mountain. It took him 22 years. The tunnel is about a half mile long and you can walk the length of it. A monument to obsession. After reading descriptions of the road leading to the tunnel, I decided that the Honda probably wouldn't have made it. P.S. On the way out to the car after work today I noticed something hanging from the bottom of the Honda. It looks like the off-roading took it's toll on the plastic splash guard under the front end of the car. I wired up part of it and had to cut away some of the more mangled parts. I guess a visit to the body shop is in my future. Monday night the wife and I headed down to the Santa Monica Civic Auditorium, home of "My Favorite Bead Show", "Vintage Fashion Expo", and "Santa Monica Antiques Show & Sale" to see Rilo Kiley in concert. We arrived about 15 minutes before the doors opened. All tickets were general admission and the line to get in was already pretty long. The sad thing was that we were old enough to be the parents of about 90% of the people in line. I felt completely out of place. It didn't help that about 75% were female, so being a 40-ish male made me a distinct minority. The doors opened at 7:00 pm and they separated the line into men and woman. This was due to the surprisingly stringent security at the door. They had everyone empty their pockets and everyone was frisked as we went through the door. This helped me get in the door quickly since the men's line was only a third the size of the women's. As I waited for the wife to get through security I checked out the T-Shirt selection. I was underwhelmed so I decided to pass on a shirt this time. I walked into the auditorium and saw that the floor was empty - no chairs - and the only seats were stadium seating in the rear of the venue. I went back out to the lobby and found the wife and we scoped out some seats located over one of the entry tunnels. These seats had extra padding on the seats and had an unobstructed view of the stage. They turned out to be great seats. The wife and I shared a piece of chocolate cake while we waited for the show to start. The lights dim and ... a warm up band came on stage. I had looked to see if there was going to be a warm up band and I couldn't find anything so I was a little surprised. I also was disappointed as I was hoping to get home at a reasonable hour and a warm up band meant that I would not meet my bedtime - I'm old and I need my sleep damn it! The band was Grand Ole Party. There first song was interesting but their sound seemed a little repetitive to me. The one thing that made them somewhat unique is the the lead singer is the drummer and the drummer is female. Other then that - they were just OK. The lights came up and they started moving stuff around the stage. One of the people setting stuff up was in a short - I mean short - dress and it seemed odd. Then she picked up a guitar - AARRGG another warm up band. This time it was The Bird And The Bee. I had mixed feelings about their music. It had some interesting sounds but it didn't quite grab me. I did like them more than the wife. The warm up bands finally finished around 9:20 pm. The lights came up and they started setting up for Rilo Kiley. It seemed like a long time to get set up. They came on stage at 10:00 pm and rocked the house. They played a mix of their new album "Under the Blacklight " and their older stuff. I enjoyed the music. I often listen to Rilo Kiley as I compose Homer's Travels posts and I knew every song they played. I don't think their new album is as good as "Take Offs and Landings " or "More Adventurous " but it's still pretty good. They also played a couple songs from some of their solo efforts. All in all, I liked Rilo Kiley's performance. 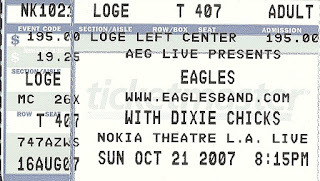 The only disappointment was the encore. The songs played during the encore were not that great. Oh well. The lights came up at 11:45 pm and we made our way to our car and struggled to get out of the parking lot - lots of obnoxious drivers - but once we got on the streets we made good time. I managed to get home and in bed by 1:00 am giving me a whopping 4 hours and 20 minutes of sleep today. I feel a little like a zombie but I'll survive. 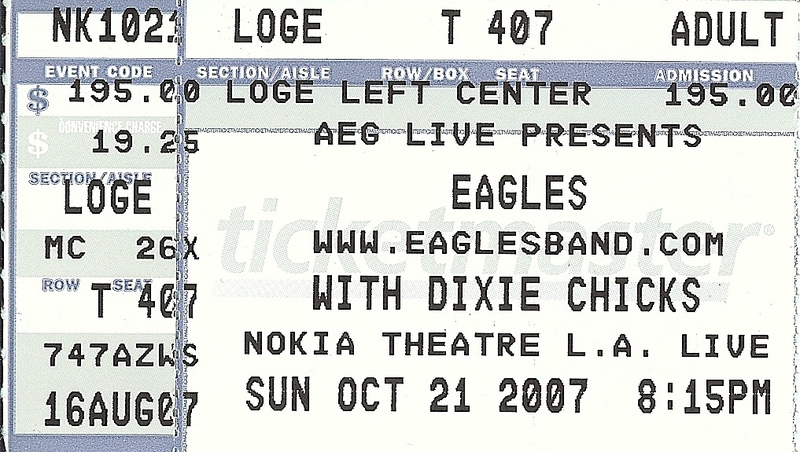 Next up, Eagles with The Dixie Chicks this Sunday. On Saturday we awoke to the ring of the telephone. The "J" was calling us to warn us about the terrible truck accident on the I-5. We were planning to drive with the "J" and a friend of the wife whom we will refer to as the "C" as his first name also starts with J, to the California City region to visit the Mary apparitions known as Our Lady Of The Rock. I got up and fired up the computer and plotted out a new route that bypassed the I-5 - Route 14 interchange. We got in our car (the "C" drove up the night before and spent the night with us), picked up the "J" and headed out. We took the 126 to the I-5 North to the SR138 east to the 14. This route bypassed all the mess further south. We reached Mojave and, since my lead foot had gotten us there ahead of schedule, we stopped at Mike's Roadside Cafe for some breakfast. The food is pretty good there but the service is a little slow. The cafe is decorated with dozens of Pedal Cars. We got back in the car and drove into California City. We located the Randsburg-Mojave road (R-M) and headed out. After a short distance we saw a red arrow pointing off road but I noticed that we were now on Twenty Mule Team road instead of R-M. We turned around and found where the R-M split of from the Twenty Mule Team. The R-M turned to a dirt road immediately. This seemed right because the Mary apparitions were supposed to be off a dirt road. After driving a while without seeing any signs and seeing only RVs and dirt bikes, we turned around and went back to where we had seen the red arrow. We drove off road for a while following the arrow but it soon became clear that the ol' Honda Accord wasn't going to make it very far. We called the library and they described where we were supposed to go and insisted that it was on the R-M road. I should have known better - the descriptions being given were of things - Galileo Park, the Prison, the Silver Saddle Spa and Resort - that were on the Twenty Mule Team Road but instead we went back to the R-M road and continued on the dirt road. It eventually became clear that it wasn't on this road. The road eventually met up with SR395. We visited three semi-ghost towns - Red Mountain, Johannesburg, and Randsburg (Photos here). All three towns were related to the gold mines in the area. Randsburg had some interesting atmosphere - somewhat geared to the visitor unlike the other towns that were just run down and depressing - but not enough to save this trip. We went back south on SR395 figuring that we could take Twenty Mule Team road back to California City. We nearly missed the dirt road that was this end of Twenty Mule Team road. The "J" groaned about another dirt road and I decided the ol' Honda might not survive another off road trip. We stayed on SR395 promising to try again on the next 13th that falls on a weekend - 13 January. At the urging of the passengers, I pulled over and let them take Polaroids of the sun to see if Mary was on the SR395. She wasn't ... we think ... The pictures are open to interpretation. We made our way to SR58 and headed back to Mojave. The wife, the "J", and the "C" all took naps as I headed back. As we approached Rosemond, the wife asked me about another ghost town nearby. We took the Rosamond Blvd. exit and drove to the ghost town of Willow Creek. There isn't much there except for a plaque marking California Historic Landmark #130 and some stone building. As we were reading the plaque from our open car window, a young boy dressed like an Amish with black dress pants, a white shirt, and a wide brimmed hat, came over and asked "Who that?" The "J" ask him who he meant and he just repeated the odd question before walking away. We aren't sure if he had it all going on upstairs. We left Willow Creek and it's odd little boy and headed south. My plan was to pick up SR138 and head back to I-5. Turns out that in this part of the desert, SR138 is called Avenue D. We had no idea and drove on south until we ran out of road and had to turn left. We drove back to the 14, turned north until we saw SR138 and headed back west to the I-5. If you are following what I am describing, you may realize that we drove a large square in the desert west of Lancaster. Sigh. We made in back home at a reasonable hour of 5:00 pm. This was a little disappointing. We missed Mary entirely. The four ghost towns were very disappointing. We consoled ourselves with the fact that this was our first failure of a roadtrip and that we would have another chance in January. To top it off, my body was sore from my Cathedral Peak hike and, as I sat in the car for nearly nine hours, I could feel muscles stiffen up. Several muscles was killing me by the time I got home. I guess they all can't be winners. Yellowstone is a beautiful park. Unfortunately my strongest memory of the park was driving across the park stuck between R.V.s. It seemed like it took a long time to get anywhere in the park. Everywhere I went hundreds of slow moving Winnebagos tried their best to slow me down and they often succeeded. It didn't help that several roads in the park were closed forcing visitors to detour around to get to places. I was staying in Gardiner near the north entrance of the park. The first day I headed south looking for Old Faithful. I stopped along the way to see hot springs and bubbling mud and all the other things that remind us that Yellowstone is an active volcanic region. I decided to do a short hike. I did the Mystic Falls trail, a short but interesting trail that took you past a large burn area. The devastation was creepy but there were signs of life everywhere. The new tree growth was just over waste high at the time. The trail climbed the side of a hill. 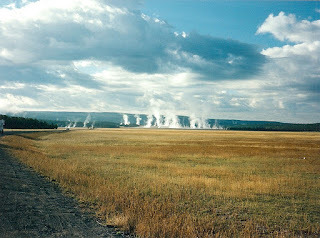 At one viewing point you could see various geysers, including old faithful, spewing steam and erupting in the distance. It was pretty cool. I also saw a lot of wildlife: Elk, a coyote, and swans. No bears though. After the hike I drove to Old Faithful and watched the geyser do its thing. Looked just like the pictures and was right on time. On the way to the Canyon Village area, traffic slowed to a crawl as a herd of Bison decided to cross the road ... one at a time. A bison would walk out to the middle of the road and stop. The other bison would line up behind this one and not move until the leader decided to slowly saunter off to the other side. This went on for a half hour or so. I think they did it on purpose just to irritate me. I finally made it to Canyon Village and did a hike. The hike was a 6.0 mile loop to Ribbon Lake and Clear Lake that went through prairie with Bison in the distance before going into the forest. I reached a campground which was supposed to be at the junction to a trail that would take me back to the trailhead. I was a little disappointed in the signage as I was confused to where I needed to go. There were several trails leaving the campsite. 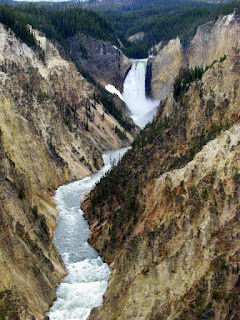 I took one path and found myself on the edge the Grand Canyon of Yellowstone. The views were awesome but it wasn't the way I was looking for. I took another trail and it turned out to be the correct one. The trail winds through the trees. There was supposed to be a side trail to some pools or ponds but I missed it completely. The path eventually came out into a clearing filled with bubbling mud. It was really neat. I took some pictures and carefully walked around them. I have heard stories of people getting too close and falling through the thin crust into the boiling mud - not a good thing to do unless you want to know what a lobster feels like. 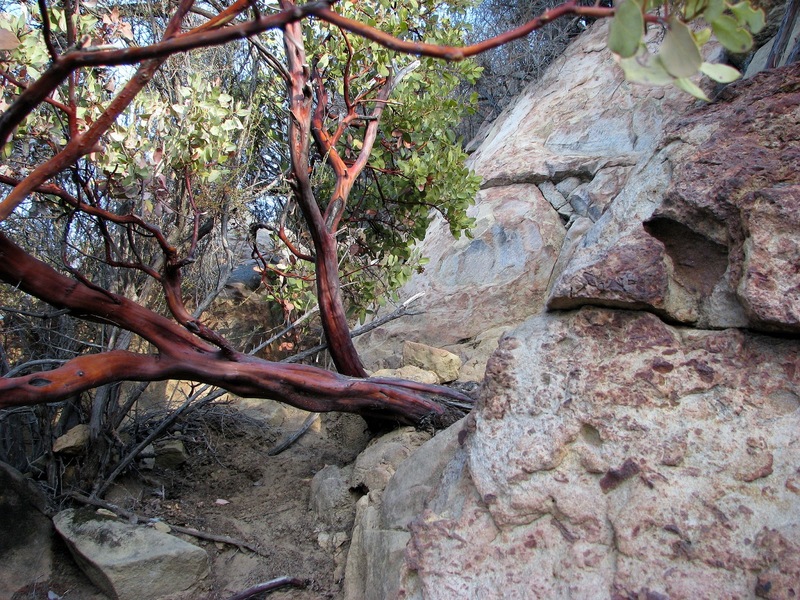 The trail eventually brought me back to my car and I drove to nearby Inspiration Point where I watch foolish children walking precariously close to canyon's edge. This is the same kind of family that puts honey on their children's face so they can get a picture of the bear 'kissing' junior. The next day I drove over to the west entrance of the park and went to an IMAX movie about the park. I then made my way out the south entrance of the park. I had been on the road for two weeks up to this point and I was also a getting tired so I didn’t plan this stay well. I missed quite a lot. I will have to return someday with the wife. Yellowstone pictures can be found here. I took the short drive to Grand Teton NP. 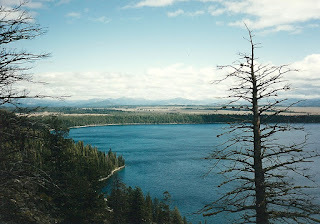 The Grand Tetons were not on my original itinerary but, due to the changes I had made on the fly I had a few extra days. I decided to spend a day there before going to Rocky Mountain NP. I spent the night in Jackson, WY. Well, I went to the doctor this afternoon so he could take a look at my foot. It turns out I am suffering from ... tendonitis. Turns out my self diagnosis was spot on. The doctor suggested a pair of custom orthotics - a suggestion that I agree with since the cheap over-the-counter orthotics I'm wearing are helping quite a bit. The doctor recommended a place in nearby Camarillo where I could get a custom pair and next week I will look into getting me a set. I'm glad I went to the doctor. Even though he only confirmed what I already knew, now I know it's not something worse then tendonitis. This Friday I'm hiking Cathedral Peak - My foot and I can't wait! We're planning the drive out the California City to see Polaroid Mary,better known as Our Lady Of The Rock. I mentioned this a while back. This Mary apparition is not sanctioned by the Catholic Church. The wife found out first hand what this means when she called the Catholic Church in California City to get directions to the apparition site. When she asked the person who answered the phone about the Mary apparitions she was told that she didn't know anything about it. When the wife pressed on, the person repeated that she knew nothing about it. The impression the wife got was that she knew a lot about it but was not allowed to acknowledge the existence of Our Lady Of The Rock. I guess we didn't know the secret password. Tomorrow the wife will try again, this time calling the California City library. If we don't get any answers, then we will probably just drive out there, find a bar or cafe, and start asking people. AAAAAAAAAAAAAAAAAAAAAHHHHHHHHHHHHHHH! It feels really good to be back out on the trail. It has been a month since I hiked as I waited for my foot to get better. My foot hasn't gotten better but more about that later. This Sunday I hiked Heartbreak Hill and Liberty Canyon trails. The hike is a 6.58 mile Up-Down There-N-Back. You know something? There's a reason it's called Heartbreak Hill. Each time you reach a point where you think you've reached the top of the hill, you turn a corner, see another hill, and your heart breaks. I lost count of the hills after four. Not only that but whomever cut this trail did not believe in switchbacks. The trail heads straight up the hills and often goes from steep to OH MY GOD vertical. It's just crazy. The hike description called it a 1,000 feet elevation gain and it turned out to be just 700 which probably was my salvation. There were some more hills past my turn around point that could have easily added another 300 feet of vertical to the hike so the description I had was probably right for the longer hike. I had my GPS programed with 14 geocaches - 12 based on the 12 days of Christmas (you know, partridges, pear trees, leaping lords, maids a milking, all sort of fowl). The caches turned out to be pretty easy except for the last one, "One Good Cache..." which nearly drove me the short distance to Nutsville. I eventually found it but man I was frustrated. The last cache also marked the turnaround point of the hike. On the way back I detoured from the over the hill trails to a couple of side trails that bypassed a few hills. Actually, these detours were the marked trail and the over the hill trails were the unofficial trails. Several of the caches were on these unofficial trails on the tops of the hills. These side trails turned out to be shaded and cool. On Sunday we had some mild Santa Anna winds. I didn't feel them very strongly on this hike but they still felt good. Santa Anna winds tend to be hot but these winds were just a little warm and cooled me off giving me some relief from the bright hot sun. The wind sounded cool rustling the dry tree branches - very relaxing. There was only one other couple on the trail. That doesn't mean I didn't have traveling companions. The trail was a veritable super highway for these guys. Big red dudes. Not sure but they may be fire ants. From part of the trail you could see Ronald Reagan's old ranch when he was Governor. 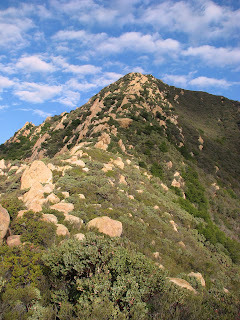 The views from this hike are very nice but nothing different from many other hikes I have done in the Santa Monica mountains. I ended up taking only three pictures (here). Now, about the foot. The foot pain I have been experiencing since August 25 just isn't going away. The level of discomfort - more an irritation then pain - plateaued about two weeks ago. I've tried cold, hot, anti-inflammatories, and shoe inserts. The shoe inserts have helped the most. It looks like more arch support helps relieve the pain. As soon as I take the shoes off though, the pain returns. I have a doctor's appointment on Wednesday and we will see what he says. At this point I am not going to let it get in the way of my hiking. My foot doesn't feel any better or worse after a hike so, unless the doctor says differently, I am going to resume my weekly hiking schedule.